One of our client recently had an annoying comment posted on his site. Even more annoyingly, the commenter had posted a fake email and clicked Subscribe to Comments. Now this client runs a pretty busy client section: 200 comments per post is not uncommon. Result of the fake address passing: over 200 bounced emails in his inbox. 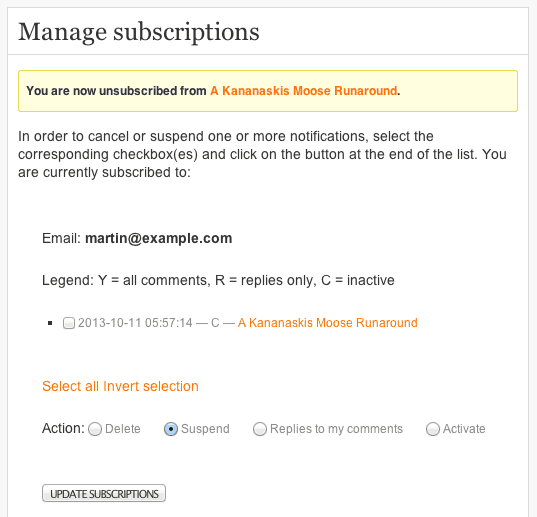 Richard tried to remove the commenter's subscription in the admin section of Mark Jaquith's Subscribe to Comments (WP Plugins). It didn't work. We tried to block the user from receiving any comments. Didn't work. 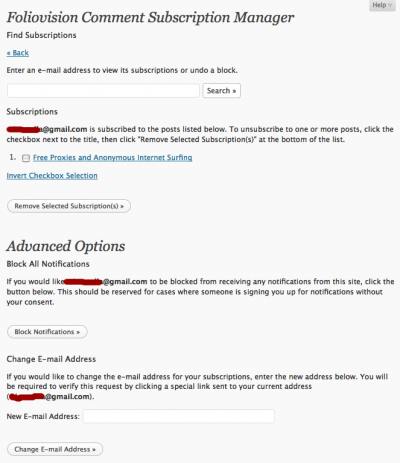 Clearly there is an issue between WordPress Subscribe to Comments and WordPress 2.9. Easy enough to fix. But we have about five popular plugins right now in active development and adopting another step-child would take us away from our existing work. What did work for stopping the bounced emails, we simply removing the commenter's address from the email. After that we did a bit of looking around and a fellow by the name of Martin Spuetz has written a fork called Gurken Subscribe to Comments (WP Plugins). What's important is that Gurken Subcribe to Comments is fully compatible with Mark's version which means that installation is just a question of disabling one and enabling the other and at some future date it would be possible to switch back again. 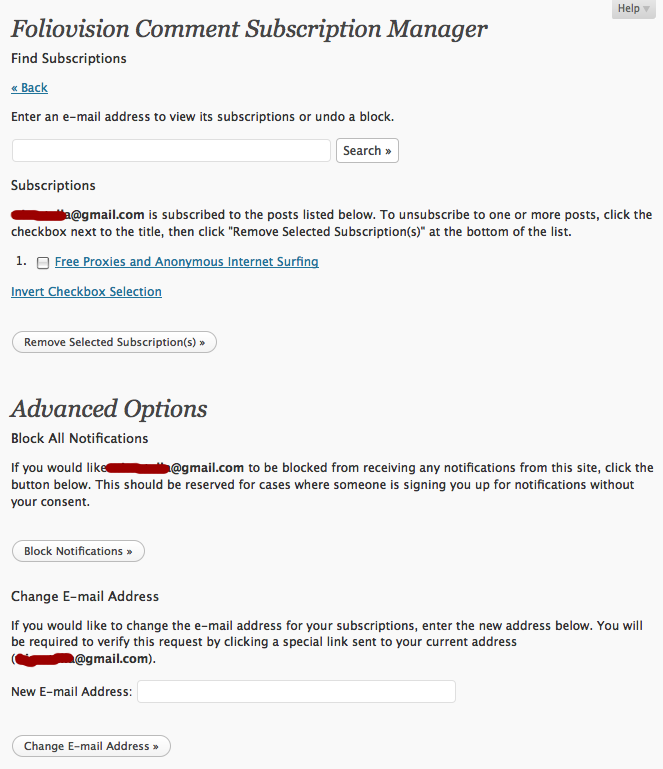 Gurken Subscribe to Comments admin section does work, allowing commenters to be unsubscribed or blocked. It has another big advantage: which is double opt-in. A user has to accept being subscribed to comments. How can double opt-in help? A fake email will only bounce once, not 200 times. A real email which is being routed into someone's spam bin will only go once. If someone subscribe's with someone else's email, s/he will only be disturbed once. 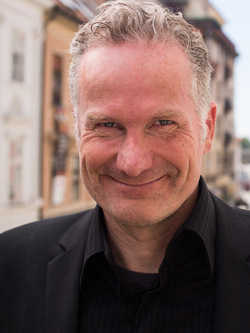 I don't know when Mark is planning to update Subscribe to Comments, but a big thank you to Martin Spuetz. As usual with German plugin authors, the code is excellent but the documentation is all in German. Fortunately Martin and I both speak German, so there is a whole new world of plugins out there waiting for us. We're also trying Sergey Müller's Antispam Bee (WP Plugins) in place of WP Spam Free, as even with our custom modifications on a busy site WP Spam Free puts a heavy load on servers. Here's the excellent German documentation. Here's the English documentation. Wait, there isn't any. I too use the Subscribe to Comments and am frustrated with the bug (and the develper not interested in fixing it). I saw the other plugin you mention but didn’t see any English so I left it. But, I’m willing to try it given your post (thanks!). But I just wanted to make sure that when you say I can deactivate the old one and then activate the new one, that this means that all current subscriptions will still be active, without having to double opt in on them. Just replace and go, right? you are right, all the subscription from original Subscribe to Comments plugin are already considered as confirmed, no double opt for them. Thank you so much for writing this up. I’d been frustrated as well with the Admin section that did not work. But I was afraid to install a German language plugin I did not understand..
By the way, for anyone doing this, you have to deactivate the original plugin first, before installing the new one; if you try it the other way around, you will get an error. Now, I just have to see to add a Subscribe without commenting box. I think there is a way to do that. I love this plugin, it´s really great! I did many tests and when I subscribe an OLD post, no email has been sending when someone write a comment on it. Again, If I publish a new post, the plugin works fantastically! we are using this plugin on many sites for a long time and we haven’t experienced any issues you’re describing. We just tested the actual version of this plugin on old posts to look specially at this issue, and it worked without any problems. Your problem might be somewhere else, the plugin seems to be working fine. I am currently using your plugin on my site. The site is used for testing and creating pages for other sites. I tried to check off the remove clear:both which is what is causing this but the check mark comes back on its own. and when I click on the subscribe to comments under settings the check mark is automatically back again. Any and all help is appreciated here. I really mean that. Thanks for the solution, before this I’ve been using Subscribe to comments with some modifications to work as I expected it to. i have the same problem like Saxama, any solutions?